A LITTLE PIECE OF PARADISE. 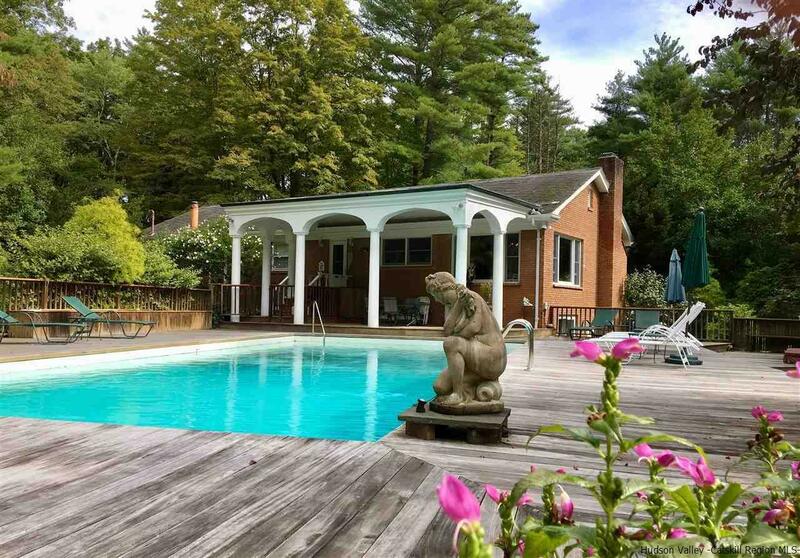 A TRULY ENCHANTED 8 ACRE ESTATE WITH MAGNIFICENT 4 BEDROOM 4 BATH HOUSE AND SEPARATE COTTAGE, VIEWS OF LARGE POND, WATERFALL, HUGE 6 LEVEL DECK, AND HEATED SALT WATER POOL If you've ever dreamed of life on a beautiful gated estate or running a bed and breakfast this is a must-see property! A spectacular oasis that sits on eight private acres, The Enchanted Manor is surrounded by forest and meadow, a gorgeous pond with a waterfall, and organic vegetable gardens. You will never want to leave the magic vibe of this property. Wake up each morning to the tranquil sounds of nature. With over 3000 square feet of living space, your family and loved ones will enjoy the meticulously landscaped property, perfect for family gatherings. Guests love the 42' heated, Gunite saltwater pool, outdoor hot tub, sun deck, and portico. Down a private path, there is an additional 1 BR guest cottage with private bath and propane pot belly stove. Inside, the spacious white-columned brick house you'll find two beautiful rooms where you can bask in the warmth of wood-burning fireplaces. The dining and kitchen are surrounded by huge picture windows that frame our outdoor paradise including views of the Buddha Garden, pond, and the forest. There are 4 super-cozy bedrooms, all with private baths (including 3 jacuzzi tubs), and the master suite has its own living room and fireplace. There's a two car detached garage and a propane generator. The house has been chemical free for 17 years. Perfect for anyone with chemical sensitivities as all cleaning products have been organic and chemical free. The pool is salt water with no chlorine. We're excited to share this new listing! Properties like this don't come around often! So don't miss out. Is currently being used as a tastefully-furnished B&B with the perfect combination of antique charm with modern amenities. Located six minutes to the happening, historic, famous town of Woodstock, with art galleries, fine restaurants, music and theater, 10 minutes to The NY Thruway, 12 minutes to Kingston, the new Brooklyn, and short drive to Hiking, Biking, Tubing and monasteries. Can be your own Enchanted Manor or a thriving BnB business for you to take over.